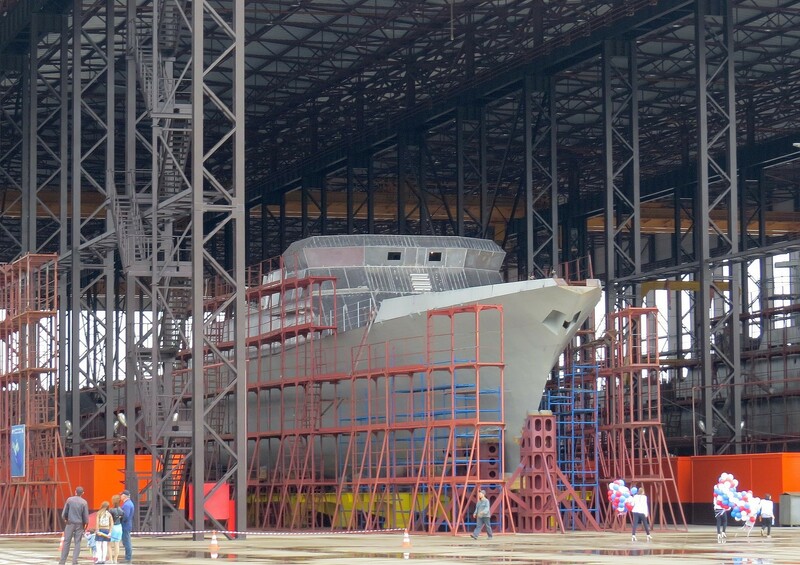 Well this is big, Crimea is back in business and already building proper warships. 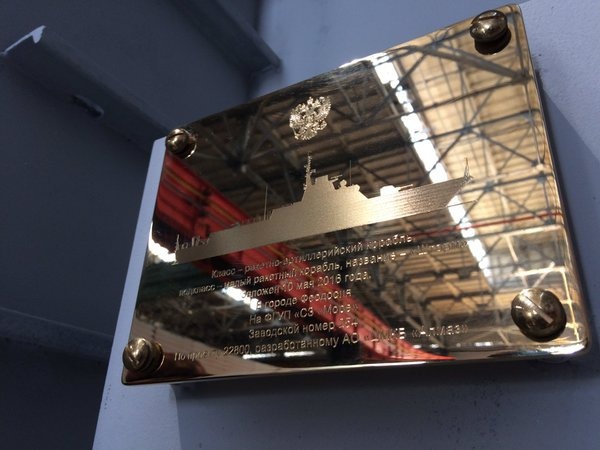 They are about to outdo entire ukrop naval shipbuilding in the past three decades. I just hope that Crimean shipyars will do better then those on far east. This is really good news. So, Black Sea fleet will get Karakurt missile corvettes for anti-ship role and to replace old Nanuchka and Tarantul missile corvettes. I think this is proving my oppinion, that Buyan-M corvettes are actually new class of land attack cruise missiles corvettes for conventional or nuclear strikes on ground targets. This ship was now battle tested and proven to be effective. This will be an interesting combination of Buyan-M and Karakurt corvettes in Black Sea and in Mediterranean Sea. 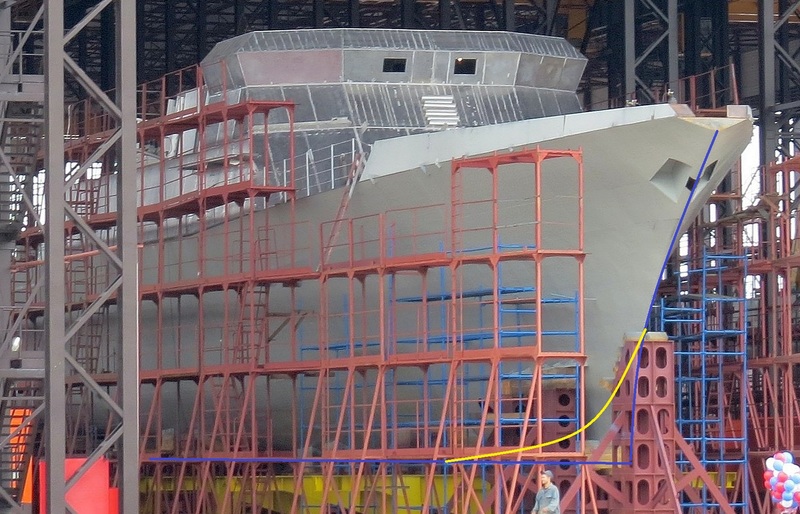 I hope Crimean shipyard will also build Karakurt corvettes for Caspian fleet. medo wrote: So, Black Sea fleet will get Karakurt missile corvettes for anti-ship role and to replace old Nanuchka and Tarantul missile corvettes. I think this is proving my oppinion, that Buyan-M corvettes are actually new class of land attack cruise missiles corvettes for conventional or nuclear strikes on ground targets. This ship was now battle tested and proven to be effective. This will be an interesting combination of Buyan-M and Karakurt corvettes in Black Sea and in Mediterranean Sea. Both Buyan-M and 22800 are same class of ships (missile boats to be more accurate) but 22800 is proper ocean going vessel. Buyan-M is modified river ship, more than good enough for Black Sea and Med but not beyond. Their primary purpose would be land attack, not anti-ship combat. Other than that they will be patrolling the littoral zone where they will be covered with Kilo subs and land based AA systems and naval aircraft. Once Buyans and 22800s are built in sufficient numbers other corvettes, frigates and larger ships could be passing down land attack tasks to them. For example, Gorshkov and Grigorevich frigates now have 8 land attack and 8 anti-ship missiles but later it would make sense to switch to 16 anti-ship missiles because for Russian Navy cruise missile strikes against land targets are exception rather than the rule. And 90% of likely land targets could be hit by Buyans and 22800s with Kalibrs without even leaving ports or traveling too far from their "safe zone". This would enable proper warships (corvettes, frigates, etc...) to fully focus on their primary task (anti-ship and anti-sub ops) and if need arises for land attacks with cruise missiles then Buyans and 22800s can just tag along with larger ships and act as "missile trucks" all the while being under anti-air and anti-sub cover provided by those larger vessels. Basically just follow rest of the fleet, launch Kalibrs and head home. I think this might be the reason why 22800 is lighter than Buyan but still uses same engine, it needs the extra speed to keep up with corvettes and frigates. medo wrote: that Buyan-M corvettes are actually new class of land attack cruise missiles corvettes for conventional or nuclear strikes on ground targets. This ship was now battle tested and proven to be effective. This will be an interesting combination of Buyan-M and Karakurt corvettes in Black Sea and in Mediterranean Sea. Any ship that carries Kalibr can do this job. If you have Buyans for land atttack and Karakurts for anti ship role, it is not a good combination as the ennemy will know their role. If you have just one type of corvette for both roles, they will not and the mass production of one type makes the ship cheaper. Even if not fitted with its own sonar, the Sigma battle management and communications and data sharing system would enable the data from all nearby sonar equipped vessels and even satellites and aircraft and submarines and even land or shore based and under sea listening arrays can be combined to give even the smallest corvette data on underwater threats to allow a mach 2.5 ballistic rocket to deliver a homing torpedo in a few minutes to anywhere within 40km of the vessel. It's true, that in UKSK you could place many different missiles from Onyx to Calibr with its anti-ship, anti-sub and LACM variants. But which missiles ship could use depend on its fire control system. Gorshkov and Grigorovich frigates have all needed sensors from sonars to anti-ship radars and data links to use all type of missiles. Buyan-M doesn't have sonar or anti-ship radar, so it could not use Calibr missiles in anti-ship or anti-sub variants, but only in LACM variant to strike ground targets. Karakurt will be equipped with anti-ship radar to detect surface targets for anti-ship missiles, so it will be mostly used in this role. But of course, if Ru NAVY will need more cruise missiles for attacks on ground targets, Karakurts will be armed with them as well, what means Karakurts will also represent nuclear strike capability and could patrol with 4 LACM and 4 anti-ship missiles. I'm not sure if Karakurt will be equipped with sonar to use anti-sub version of Calibr missiles. You clearly didn't read my post... even Buyan has Sigma C4IR system so even if it cannot generate sonar data itself it can get it off platform by sea bed sonar arrays or even other submarines or surface vessels or aircraft. GarryB wrote: You clearly didn't read my post... even Buyan has Sigma C4IR system so even if it cannot generate sonar data itself it can get it off platform by sea bed sonar arrays or even other submarines or surface vessels or aircraft. I don't really get the large amount of criticism of this class. After the Subs & in the absence of significant numbers of 11356/22350 coming online (for various reasons) I think 22800 Karakut is the most important navy project. With the very specific physical circumstances of Russia I think it makes sense to build a lot of fairly small missile boats. 6 each for the Black, Baltic & North fleets is not that great but the ability to relocate them via the river/canal system opens the possibility to fairly quickly concentrate up to 144 UKSK tubes in any of those seas (Caspian too). Also there has been criticism of weak AA and thats certainly true of the initial version with only 2*AK-630s but if/once the expected Naval Pantsir shows up (though why not use Palash now?) they will probably have the best AA of any ship up to the 20380s & possibly much bigger excluding that class. I've seen it suggested on other forums that there should be a dedicated AA version & I think that there is possibility there: replace the UKSK with Redut, give it Furke or better (I think its actually getting the same new Zaslon AESA as 20385 already?) & you have a pretty impressive AA ability (even if Redut on 20380 isn't considered great), with Redut being smaller & lighter maybe even remove the main gun & add at least another 8 Redut tubes. Obviously this would be useless for other tasks but I see it as maybe 1 in 6 providing an AA umbrella for the squadron in absence of 11356/22350s. I had at first thought give it Fregat/Shtil-1 for 'availabile now' factor but if Furke/Redut is actually working OK(ish) for 20380 then that is probably the better course. Similarly I think rather than a separate class for antisub (the concepts I've seen look more superyacht than actual practical naval ship) a modification of Karakut seems like a better idea. Though I'm not sure quite how that would work, proper antisub would be really hard to fit into 800ton. Maybe remove gun & AA, add hull sonar & Packet? Without removing the UKSK you'd have a hard time finding enough weight/volume for a more significant antisub setup but removing the UKSK removes that long range antisub Calibre. Assuming a 6 ship squadron you would be able to use the UKSKs of the rest of the squadron for carrying the antisub Calibres but that would eat into their main antisurface mission even more. But if we assume that there will be some form of larger ship available to provide AA cover/Antisub sensors a 6 ship squadron of basic Karakut working with it can provide significant extra firepower. In summary: I hope Russia will be able to actually get decent numbers of these in service quickly. Well I don't think there is that much criticism, these are good boats. You made good observation, Buyans are river boats with UKSK launchers added as an upgrade. Karakurts are same class of ships but they are built from ground up around UKSK and can operate in oceans unlike Buyans. That is why Caspian and Black Sea fleets will be getting more Buyans while Ocean fleets will be getting Karakurts. You might be on to something with replacing main gun with Redut launchers. It could be good idea to build that version as a support platform. That way they would preserve cruise missile ability. Making anti sub version would only require adding sonar because UKSK launchers can fire torpedoes. Actually torpedo carried by cruise missile with 40 km range. So this version is even more probable. Planned successor to Buyan (Project Sarsar) is suppose to come in four versions: anti ship, anti ship light, anti sub and patrol version. Best thing about Karakurts is that they are built in shipyards that were not building warships before or for a very long time (Pella, Crimea) so they do not take up existing construction capacities. And I assume that there might be other civilian shipyards out there that could also start building these ships. And what will a western frigate do when faced with a torpedo attack? The Soviets and Russians have done extensive work on super cavitating rounds... they have underwater small arms in service and so a 30mm version should not be totally impossible. Your suggestions are interesting, but I think a better option is to make each corvette the same as the others in the same class and when subs are a threat include a Destroyer with the group of corvettes to find subs and pass data to the corvettes so they can use their anti sub missiles from their UKSK tubes all the while enjoying the air protection of the destroyer. For anti smuggling/drug related/illegal fishing roles corvettes can operate on their own and would find their gun armament the most useful, so don't remove flexible useful weapons for the once in a lifetime chance of WWIII. These vessels will spend 99% of their time not using their most capable weapons... I don't think situations in Syria are going to be common for Russia. One more, Crimea s officially back in business. Apparently the Pella shipyard building the first 2 is/will be heavily involved in the Crimea shipyard which explains a bit. Still the same rendering/profile with the AK-630s & no Monolith radar in the profile. Well sure, but the point was that there is a big absence of new Frigates/Destroyers coming online & specialised versions could be a way to partially make up for that absence. Specialised ships was the Soviet Navys past. The future is multirole ships in modular form. Specialised ships like Sovremmeny or Udaloy means you need to accurately determine the threat and build the number you will need... if you are wrong there is a problem. So building 10 Sovs and 10 Udaloys means you have 10 anti ship ships with good area SAMs and 10 anti sub ships with close in SAMs for self protection only. New vessels will have UKSK launchers so can perform anti sub or anti ship or land attack roles depending upon which weapons are loaded in port... so instead of 20 ships you can probably get away with 15 and just arm them for the roles they are needed for. In the case of some of the corvettes their self defence can look a little weak... but remember these vessels with Gibka is not really a guy on the deck with an Igla... with radar and EO sensors directing the Gibka turret it should actually be quite a capable CIWS... remember SEA RAM, the US CIWS is just a mix of Stinger and Hellfire components, so its seeker would be inferior to even Igla, let alone Igla-S or Verba. Equally in a few years Morfei will be ready and offer fire and forget lock on after launch IIR short range missile for self defence. KAZAN, May 10. /TASS/. 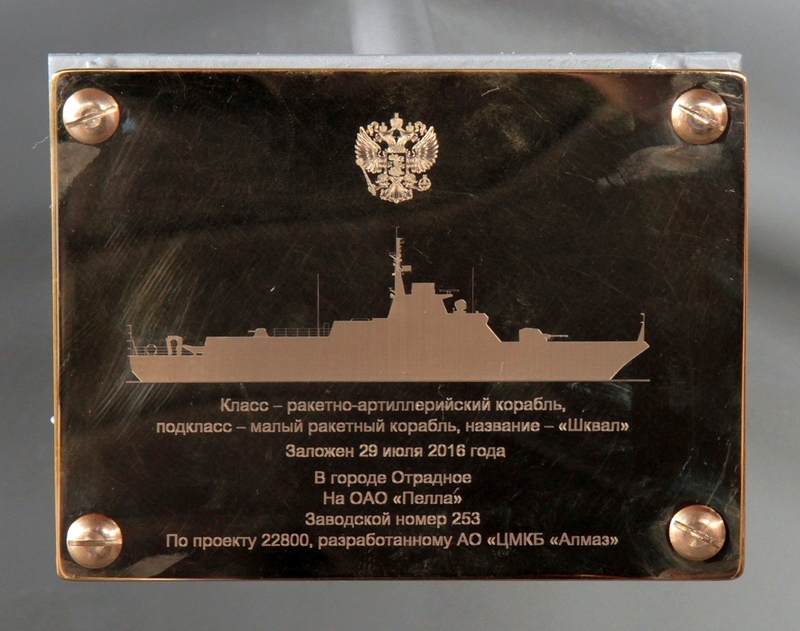 The Russian Navy may place an order for Project 22800 small missile ships with the United Ship-Building Corporation, Head of the Navy’s Ship-Building Department Captain 1st Rank Vladimir Tryapichnikov said on Tuesday. 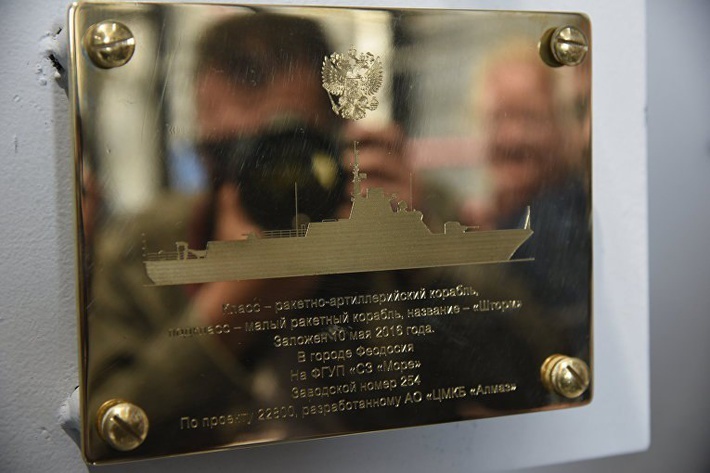 "The ships may be constructed by an enterprise of the United Ship-Building Corporation but a final decision has not been made yet," Tryapichnikov said. According to him, there are plans to build a big number of Project 22800 ships. 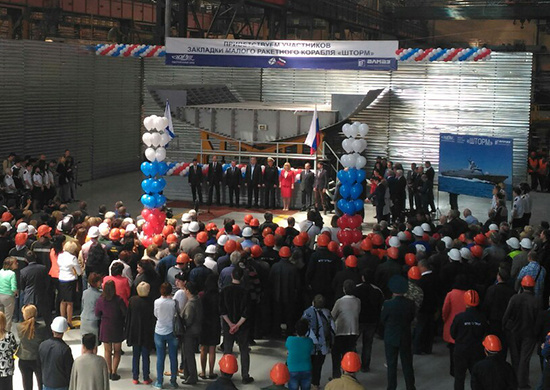 The first two Project 22800 ships were laid down at the Pella Shipyard in the Leningrad Region in northwest Russia in December 2015. 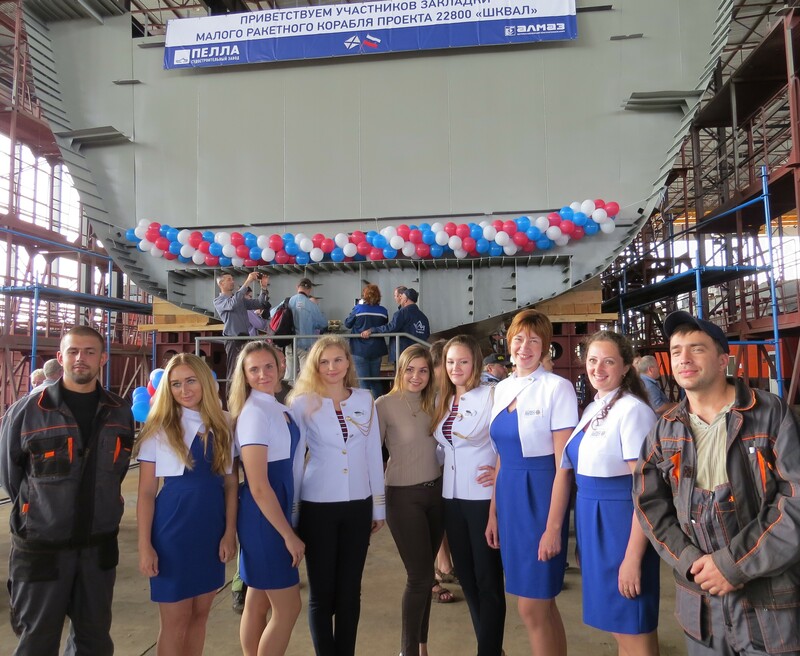 Another Project 22800 vessel was laid down at the Morye Shipyard in Feodosia in Crimea. The two enterprises do not make part of the United Ship-Building Corporation. The first two Project 22800 ships, the Uragan and Typhoon, are planned to join the Russian Navy in 2017 and 2018. More shipyards building simultaneously the better. Its a small/simple enough project there shouldn't be too much in the way of late revisions needed. If one yard winds up getting them out quicker than another, they can get more orders. 4th 22800 Shkvall laid down. 3rd at Pella. "This is a purely Russian invention. Ships with the same displacement, with such weapons, almost in the world, no one. He has eight missile complexes "Caliber", which, as you know, proved itself in the Syrian operations. Soon he will have to adopt new anti-missile system, we will have adapted "Armor", — said at the groundbreaking ceremony, Deputy defense Minister Yuri Borisov. Navy Pantsir? Awesome! 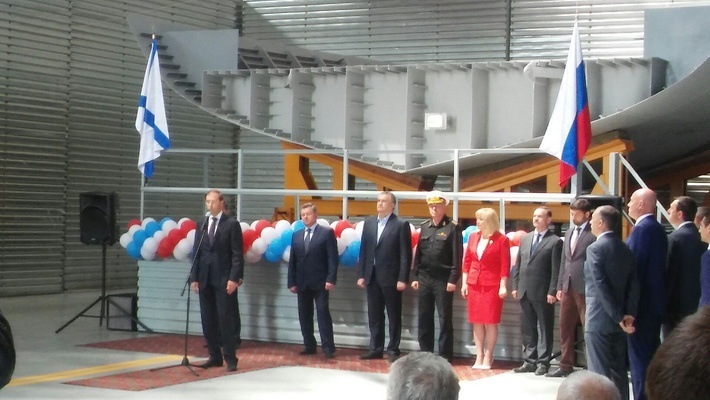 this will make it have powerful air defense between Shtil-1 and the Gibka. Looks like there has been a bow shape change since the renders? Renders show a raked planing type bow profile but this is looking like a vertical displacement type profile instead? I'm hoping some more pics from different angle show up. Nice. They are really hitting pace with this class and best of all they are built in these shipyards that were not building warships before now. This frees up other shipyards to focus on building larger vessels, Zelenodolsk in particular after they finish Buyan-M series. hoom wrote: Looks like there has been a bow shape change since the renders? I think that graphic artist who made that poster took some creative liberties to make it look sleeker.